This manual alone won't make you a bestselling author. In fact, certain divine writers break every rule in the book. (I'm talking about Heimito von Doderer.) But The Elements of Style can help you find your own. Highly recommendable for students and mediocre writers. Every writer should read this. It's short and sweet, but you'll still get something out of it in addition to the joy of checking it off of your To Read list. 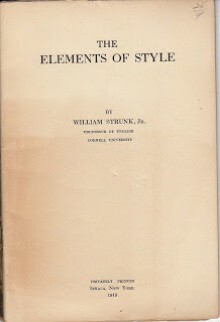 Books by William Strunk Jr.